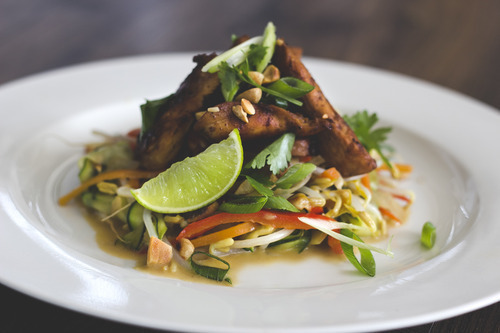 Gluten Free Chicken Breast Pad Thai. Slice your chicken breasts into thin strips and place in a dish. Combine the marinade ingredients and stir. Pour over your chicken and cover with cling film then place this in the fridge to marinade for an hour. Remove from the fridge half an hour before cooking. In a measuring jug combine your sauce ingredients. Whisk and set aside. Using a vegetable peeler, peel your zucchini into ribbons and place between two tea towels, sprinkle with salt and leave in the fridge for 20 minutes. This will draw & soak up a little bit of the water from the zucchini. In a fry pan over a low heat spoon in a teaspoon of coconut oil and your chopped onion. Let cook slowly until tender, should take around 6-8 minutes. Add in your sauce and turn up the heat just a little to reach a simmer. Add in your carrots and let cook for five minutes before adding your red pepper and half of the toasted crushed nuts. Lightly stir. Add in mung beans and zucchini and lightly toss through to coat. Leave on the lowest heat possible for ten minutes whilst you cook your chicken. Over a medium/high heat with a tablespoon of coconut oil in the bottom of the pan, fry your chicken. The strips won’t take long at all, 5 minutes per side, and they will be juicy and tender. 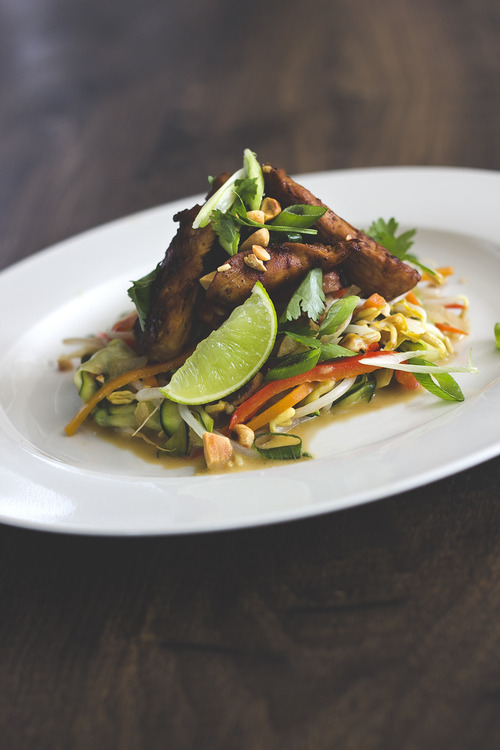 Serve the Pad Thai on a dinner plate topped with your marinated chicken. 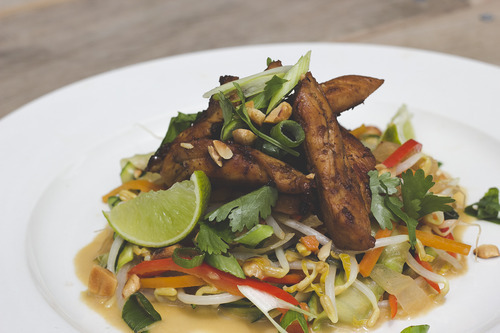 Sprinkle with extra spring onion, nuts and your fresh coriander, a wedge or two of lime and your sorted!